Federated Premier Municipal Income Fund utilizes its assets to purchase investment grade tax exempt debt securities. The total assets are $127 million. Current expense ratio fee is 1.84%. The fund’s managers are Lee Cunningham II and RJ Gallo. The current shares price is $14.29. The current high yield is 6.34%. 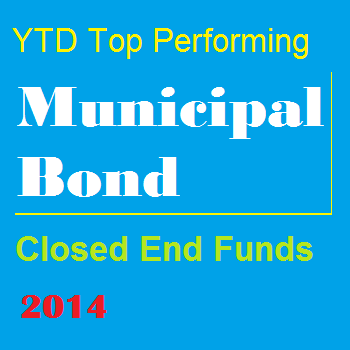 This YTD top performing municipal bond closed end fund is ranked with 5 star rating by Morningstar. The year-to-date return is 8.26% in 2014. This best fund has returned 12.12% over the past 3 year and 14.26% over the past 5 year. EV Municipal Income Term Trust is a new muni bond closed end fund. This best fund is incepted in March 2013. The fund manager is Thomas M Metzold. The current total net assets are $172 million. The current market price is trading 6.37% discount to its net asset value (NAV). The tax free yield is currently stood at 5.40%. The YTD return is 7.81%. 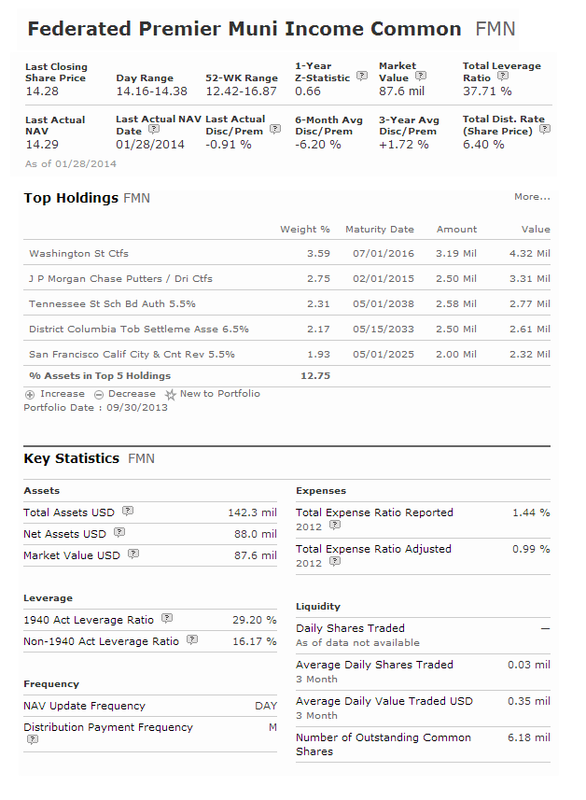 BlackRock Muni Target Term Trust is one of the popular municipal bond closed end fund. With total assets of $2.1 billion, it uses its assets to buy high quality muni bonds around the U.S. The annual expense ratio fee is 1.02%. The % structural leverage is 36.20%. In 2013, the annual return is -22.37%. 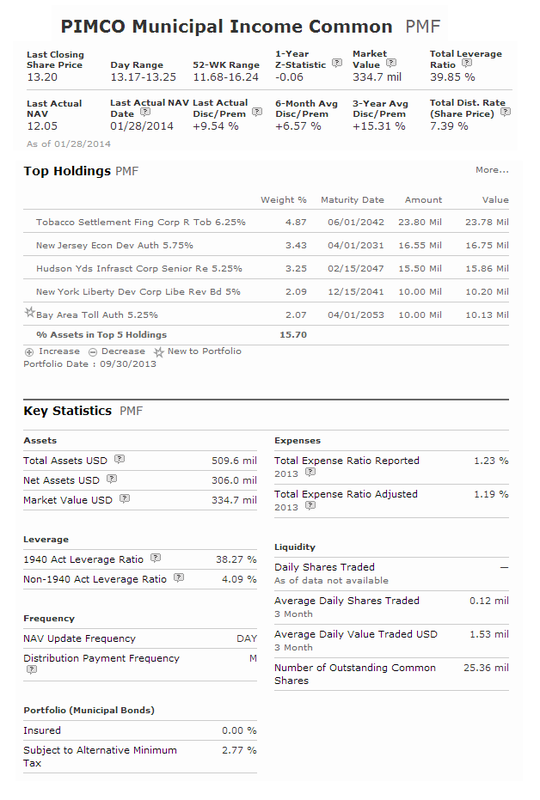 This top performing muni bond closed end fund has YTD return of 7.80% in 2014. The top 2 bond sectors are long duration municipal debts (78.49%), and municipal debt (19%). Ranked with 5 stars rating, PIMCO Municipal Income Fund is managed by Joe Deane since 2001.The total net assets are $492 million. The fund has an effective leverage of 40.35%. This fund has an average duration of 16.49 years. The total holdings are 170. The top 3 states in its holdings are California (16.33%), New York (12.17%), and Texas (10.45%). The top 5 bond sectors are hospital revenue, industrial development/ pollution control, state/local government, transportation, and tobacco.